In India the corn is roasted on coal and when ready, lemon juice, pepper or red chili powder and salt are added to taste. In the picture the man is fanning the fire with a cardboard fan. Some people prefer to apply a bit of butter too! Another way is to open the husks partially, apply the butter, close the husk flaps and let it 'bake' on coal heat. This gives a lovely charcoal flavour! Thank you all for your comments on SC & full colour versions of Strawberry vendor yesterday! I love eating corn like this. Of course I know a thing or two about cooking corn, being from the cornhusker state. I grill it in the husk and apply butter salt and pepper after, sometimes lemon too! Love this shot! Great choice for selective coloring. I can almost smell/taste this corn! Wonderful shot! Great SC! Very well composed! One of my favorite roasted street foods. The other is roasted sweet potatoes that you can find throughout China in the winter. You just squeeze them and the flesh pops out. Great use of SC in this photo, Harsh. 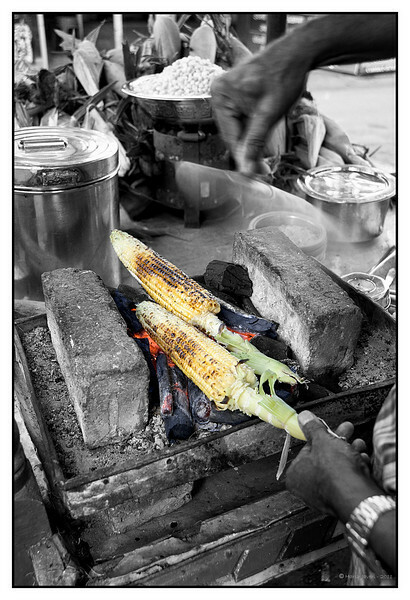 Wonderful capture, I love corn roasted in the husks. I like how you've captured the motion of the spices and the use of selective color.